In my previous most I explained how to get started running a node.js application with Azure WebApps. In this post I will note some more advanced features that I would recommend you consider for your project. IIS is handling the requests for your application initially and then proxying requests into node.exe through a named pipe port. 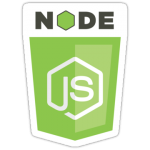 Now while node.js is perfectly capable of handling serving up static resources like images, css, html, etc. why burden it. Using a simple IIS rule in your web.config you can just have IIS serve the file directly by passing node. IISNode is capable of spinning up multiple node processes and assigning them each a unique named pipe port that it will round robin serve requests too. Now while node by default is already async and makes good use processing during IO operations. You may still have some CPU intensive sections of your app and node is basically single threaded. Multiple instances of your application will easily allow it to scale and will allow it to tolerate a few application faults without taking everyone down. You can set the nodeProcessCountPerApplication value to acheive multiple node.js instances. These settings can be configured in the web.config but I recommend setting them with the Azure WebApps Application Settings section. Unfortunately Azure WebApps disk IO performance is not wonderful. So for a real world application that contains thousands of node_modules it can take some time for it to read the entire hierarchy into memory before it can start serving HTTP requests. In order for your first request to not timeout in these cases you can extend the namedPipeConnectionRetryDelay timeout (in milliseconds) to something longer than it takes for your application to boot. This will ensure that the first request will wait to the actual response being proxied out to node responds. However that is only part of the equation. For IISNode we need to leverage Application Initialization in order to handle a primer request to spin up the node process as well. Beware of SSL. It’s important to note that Application Initialization is unable to make HTTPS requests so if you redirect all HTTP requests to HTTPS then you will need to configure at least a specific route that is allowed to handle HTTP requests in order for Application Initialization to work. A simple file read script will do the trick. I’ve broken this guide into a few key areas of pain that I went through getting the configuration right and reliable. I’ll get the con out of the way right away. Yes, you’re committing all your dependencies, code you didn’t write, which will increase the size of your repository. Deployments are faster. You only have to deploy your repository and you’re done. No concerns with running npm install during a deployment and getting a untested version of a dependency. No concerns with network timeouts or latency when downloading thousands of additional files. Just because you didn’t write it doesn’t mean you’re not responsible for it. At the end of the day it’s your application and you need to take ownership of all facets of it. Azure WebApps come pre-installed with IISNode an open source IIS module allowing you to proxy connections from IIS to Node. Enabling this feature can be done by adding a web.config file to the root if your project with a couple lines of configuration. If you’ve ever done Asp.net development then a web.config is pretty straight forward to you. But for the node.js folks the web.config is basically an xml based instructions for IIS and .net. In this case it’s going to tell IIS what to do with requests and how to route them into node. Beware of named pipes. It’s important to know that because IIS is handling the requests on port 80 your node app is actually given a named pipe string for the port instead of a number and that is what IIS will proxy requests through. Hope that gives you a good idea of how to configure Azure WebApps to run node.js and some of the initial brain teaser issues to solve. If you’re using GitHub you may be interested in doing continuous integration. Using the Azure setup wizard for continuous integration against your repository will generate a SSH key on that repository. This grants this server access to pull from your repository if it’s public or private which is great. It will also add a web hook to kudu to notify the server when a push on your desired branch is done. A nice touch of Kudu is that it will by default do a git pull --recurse-submodules allowing you to pull any associated sub modules with your project as well. However because the SSH key is only assigned to the primary project you won’t be authorized to pull the sub modules by default. You can get around this limitation by logging into your GitHub project and removing the SSH key auto generated by Azure. Then through the Kudu web interface path out to the .ssh directory, D:\home\.ssh and grab the public SSH key. Then add this key to your GitHub account instead of to a specific repository. Kudu is an open source interface for Azure WebApps that handles deployments and management of your application. It’s really awesome actually. But the primary pain comes during the deployment process. During a deployment Kudu will launch a deploy.cmd batch script that you can alter to do any unique operations for your project before and after deployment. npm install – If you didn’t follow my advice about node_modules then Kudu will have to do npm install causes it to make hundreds of requests to install node_modules. Kudu Sync – Is part of the Kudu deployment process. It’s job is to copy new or changed files. However it can easily become out of sync and mistakenly think it has already copied the file or it’s the same and not replace it. Maybe I’m just lucky at hitting fringe cases immediately but with a real world project Kudu had my files out of sync after a couple deployments. The good news is because the Kudu deployment script is just a batch script we can do anything you can do with batch. I’ve been a huge fan of robocopy for years and it’s my go to tool of choice when ensure files and folders are in sync. rem call :ExecuteCmd "%KUDU_SYNC_CMD%" -v 100 -f "%DEPLOYMENT_SOURCE%" -t "%DEPLOYMENT_TARGET%" -n "%NEXT_MANIFEST_PATH%" -p "%PREVIOUS_MANIFEST_PATH%" -i ".git;.hg;.deployment;deploy.cmd"
call :ExecuteRoboCopy robocopy "%DEPLOYMENT_SOURCE%" "%DEPLOYMENT_TARGET%" /MIR /MT /R:100 /NDL /NP /NFL /XD ".git" /log:"D:\home\LogFiles\deployment.log"
Then you will have robocopy in charge of keeping your repository in sync with your wwwroot deployments. You can configure Azure WebApps to use a specific of node by Application setting WEBSITE_NODE_DEFAULT_VERSION to the version you desire. Not all versions are available. I recommend using the Kudu interface to path to D:\Program Files (x86)\nodejs to get a list of all the available versions. Check out my next post on some advanced configurations and some additional recommendations. I successfully managed to transfer my Windows Azure Virtual Machine to a different subscription without losing any files with minimal downtime. Then UH OH! You’re going to delete my virtual machine? But that means I will lose my IP address because there will be no VMs running under that domain. THERE HAS GOT TO BE A BETTER WAY. Created a new extra small Ubuntu virtual machine and added to an existing virtual machine (the one I was about to capture). Modified the default index.html (sudo vim /var/www/index.html) and created a nice maintenance message. Created a new endpoint for port 80 temporarily to the Ubuntu virtual machine. Back on the primary machine. Started the Capture. When the capture was finished. I created a new virtual machine utilizing the image I just captured and set the subscription to the one wanted to move too. Removed Port 80 endpoint from the Ubuntu virtual machine and applied it to the newly created Windows machine. BAM! Site migrated to the new subscription and website is up and running without any loss to data. When does the MongoDB C# Driver Get Data? I prefer to work through a problem backwards so if you’re just here for a solution start here. If you want to see the process, continue reading. In the end the problem ended up being that my CPU was un-clocking itself to protected against overheating. The reason for this was due to the fact that there was a thick layer of dust between my CPU fan and heat-sink. After buying a can of compressed air and fully clearing out the heat-sink and case of any dust and debree my Maximum Frequency was back up to 100% (actually 104%). Over the last few weeks I had been fighting a losing battle with my computers performance. Recently having upgraded my Windows 7 installation to Windows 8 I started noting that flash based video play back was sluggish and would cause the rest of my tasks to feel delayed. Jumping to the obvious conclusion that Windows 8 was the problem I decided to re-install Windows 7 and get my PC back to where it was previously. Much to my annoyance and surprise the problem persisted even on Windows 7. Trying to figure out the problem was difficult. I was pretty sure it was hardware related but couldn’t understand why the symptoms would only appear to show when playing video. Again jumping to conclusions I assumed it was a video card issue or driver issue. Then one day I finally pushed my computer to the limit and it just shut off and started giving me bios error messages about overclocking and would fail to reboot. This all seemed strange because I’m not overclocking my CPU and generally my CPU runs at around less than 12%-23% so it was hardly being taxed. After staring at my the Resource Monitor for awhile I noticed that the Maximum Frequency of my CPU was at 60%. In a nut shell what it means is what the efficiency of your CPU is running at; so mine was running at 50-60% of it’s capability. Curious why this was I started poking around my bios and found an option for Overclocking Protection which was enabled. Decided to disable it about 10 seconds into booting my PC instantly shut off. My CPU was under clocking it self in order to save itself from burning out due to the additional heat. Protected by the bios setting to due this it opted to under clock itself rather than simply shutdown to keep cool. I decided open up my case and take a look at my CPU and found that there was a thick layer of caked on dust over the entire top of my heat-sink under the CPU fan. I wish there were a little more obvious hardware monitoring tools that would identify these issues so it would take some of the guess work out of identifying hardware issues.